Although Disneyland ended its free entrance on your birthday program in 2010 (as well as its volunteering program in which the first one million volunteers to sign up would receive free tickets), there is still a plethora of discounts available on tickets. It’s especially helpful if you already live in southern California, because SoCal residents, select governmental employees, and university students get special pricing, but given the comparatively small demographic, there are other discounts you’ll likely need to look into. Buying tickets online and printing them up yourself can save you a little, as can buying through your employer, if they sell them through your company’s Human Resources department. There are also discounts available for AAA members and those in the military who bring their I.D. Have a toddler under the age of three? Then you’re in luck — they get free admission! 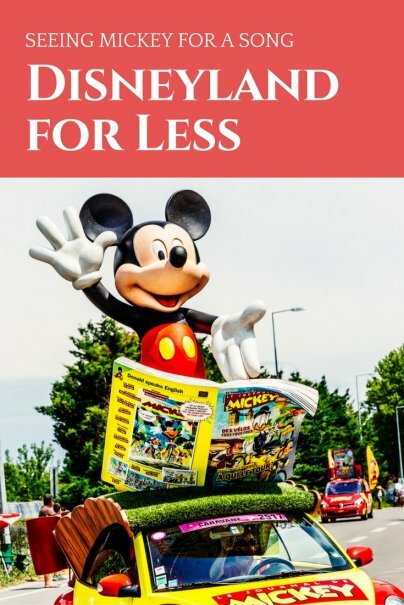 Finally, if possible, go during the off season, when you’ll not only get on more rides due to less crowding, but there are deals abound for Disney tickets. Prices for parking at Disneyland have spiked in recent years, going from $12 in 2009 all the way up to $15 just two years later. This encompasses all-day parking in the both the Mickey and Friends parking lot, as well as the Toy Story one located on Harbor Blvd. Transportation to and from these lots is provided by Disney, but even with this convenience, there are still cheaper alternatives. Those only going to Disneyland or California Adventure for a few hours might want to try parking in the Downtown Disney lot, where parking is available free of charge for the first three hours and $6 per hour after that, charged in 20 minute increments. If you do the math and it works out to be less than $15, then this is an optimal choice, and you can even bypass the crowded main entrance by showing your ticket at the Monorail station in Downtown Disney, located to the right of Rainforest Café. This will take you to another Monorail stop on the outskirts of Tomorrowland, near the Finding Nemo ride. Disneyland used to have a restriction on bringing food and drinks into the park, but now they allow select items to be brought inside (you’re supposed to eat them at the picnic tables provided). So, instead of paying over $10 for a decent meal (bottle of water not included) or $3.75 for a churro in the park, you can bring something from home for free. Disneyland has enormous overhead costs, so obviously the cost of everything is going to be more than what you’d find elsewhere. Keep this in mind before you go, and use the surrounding stores in Anaheim to your advantage. Of course, if you run out of food during the day, you can always head over to California Adventure and get free bread. When there are huge crowds and lines longer than an hour, it becomes somewhat difficult to make the most of your $80 one-day ticket ($105 for the one-day park hopper). Fortunately, there are some ways you can speed up your journey around the Happiest Place on Earth. One is single rider passes, which allow you to go through a separate line (or through the exit) on a ride, so long as you’re riding by yourself. Rides that have single rider passes or lines include Indiana Jones and Splash Mountain in Disneyland and California Screamin’, Soarin’ Over California, and Grizzly Bear Rapids in California Adventure. There are a few kiosks in the park that let you to check the wait times on each ride, allowing you to plot your route around the park more effectively. If a ride you want to go on has a long wait time, consider getting a Fastpass — a free reservation system which assigns you a time to come back to the ride at a later time (generally 45 minutes to three hours after you check in with the Fastpass, depending on how crowded the park and that particular ride are that day). After you make the reservation with Fastpass, you can go see the rest of the park. When you return at the appointed time, you go through a special express line with minimal wait. Theme parks don’t have to be outrageously expensive, even those with the brand name of Disney on them. Following these tips ought to help you save money without cutting back on the fun. Does anybody have any other suggestions for visiting Disney on the cheap? If you have a car, the hotels near the Santa Ana airport can be much less expensive for much higher quality. They are within a 30 minute drive of Disneyland, but you just have to watch out for rush hour traffic which is tough but should head in the opposite direction (bad toward Disney in the evenings). If you stay near Disneyland, you can usually walk to the park in less than 20 minutes. We went to the Florida sister park last weekend, and brought in, no joke, enough food to feed an army with absolutely no problems. Sandwiches, sodas, juices, snacks, etc. I would say it saved us at least $150-$200 between the 12 of us. Well, there's the proof in the pudding! Every dollar saved on food is another dollar you can use on souvenirs (or just save more money on your vacation in general). Most people don't realize that you can bring food into the parks though! Thanks for the personal example, Wojo!